The Gyro Shack started as a food truck in Boise, Idaho. 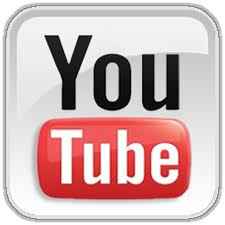 As of early March 2018, they have nine locations in Idaho and three in Washington state (others in Lakewood and Everett). 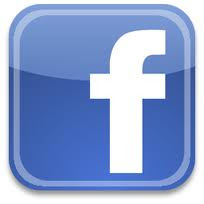 Several more locations are planned for Washington state. 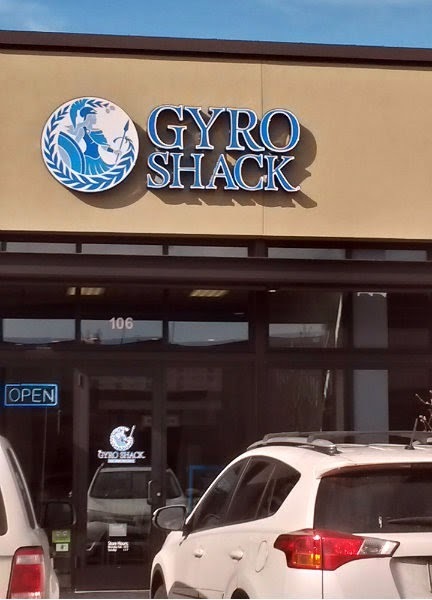 Vancouver's Hazel Dell neighborhood previously lacked a good place for gyros or other Mediterranean food, and The Gyro Shack fills that void. 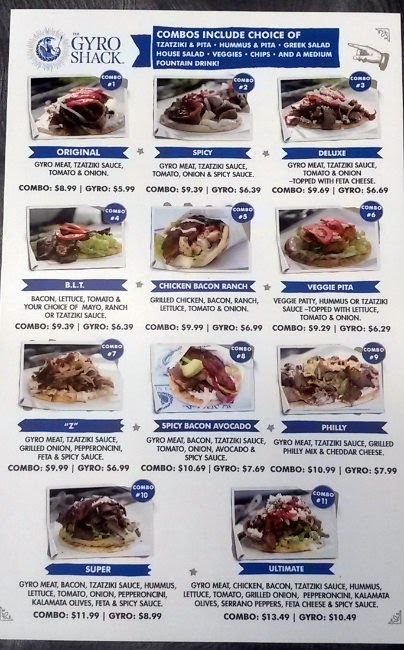 You'll see the gyro meat on the spit while ordering at the counter. 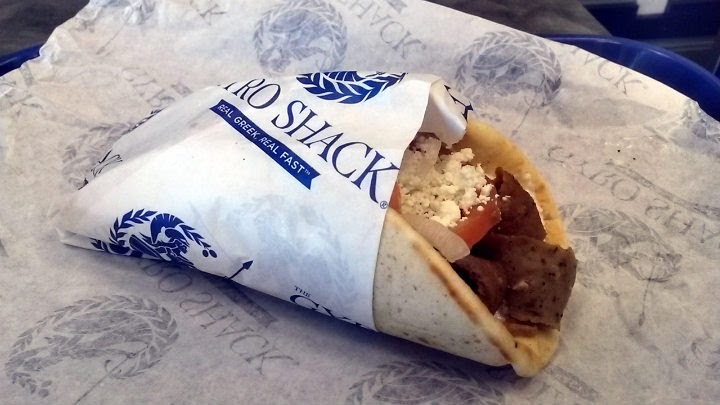 As the name indicates, this fast-casual spot specializes in various gyros. 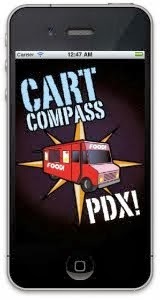 There are approximately a dozen menu options. 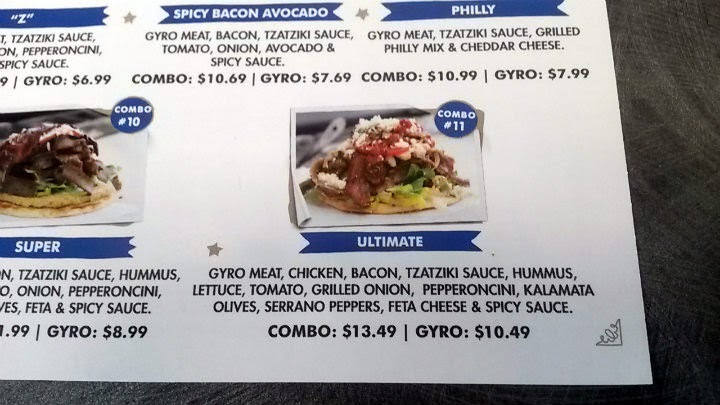 You can get just the gyro itself, or pay a few bucks more to make it a combo meal. Combination meals will include a medium drink and choice of hummus and pita (or veggies), tzatziki and pita (or veggies), Greek salad, or house salad. 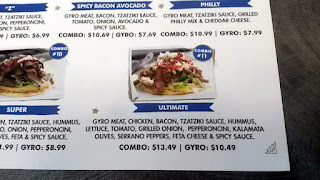 The Ultimate gyro ($10.49 gyro; $13.49 combo) seems to combine everything they have into one gyro. 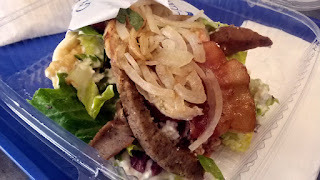 Gyro meat, chicken, bacon, tzatziki, hummus, lettuce, tomato, grilled onions, pepperoncinis, kalamata olives, serrano peppers, feta cheese, and spicy sauce. 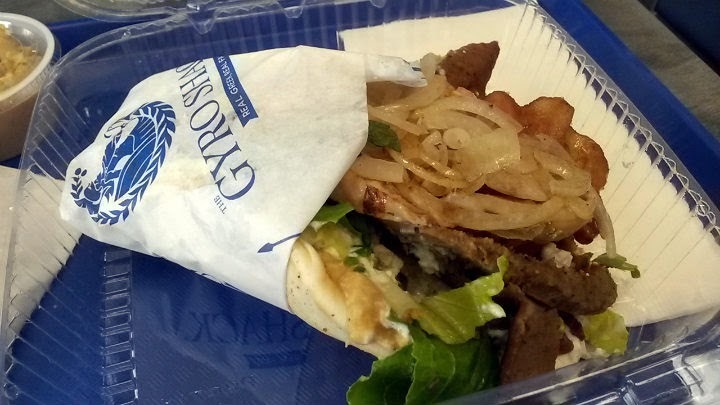 Not surprisingly, it is a hefty gyro, and a fork may be needed to wade through everything. The briny olives and the hummus were the most assertive on flavor. I loved the mix of the spicy sauce and tzatziki here. Frankly, there is so much going on that one component tries to upstage all the others. 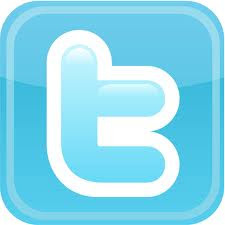 It really is well made, though, and should be an experience to try at least once. On my combo meal, I got the hummus and pita. Very good hummus here, with three warm pita wedges. 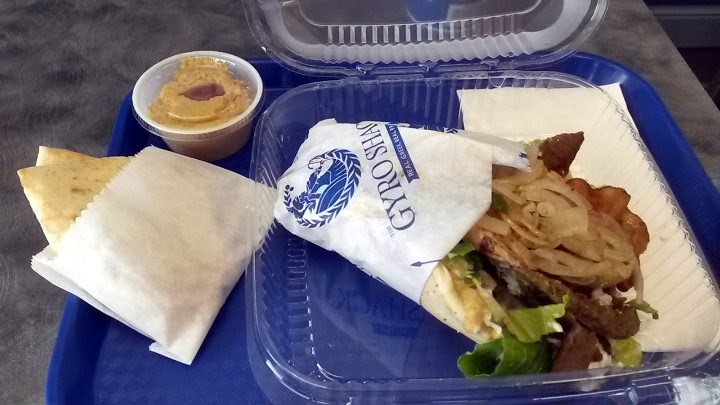 Notably, the Super gyro is like the Ultimate gyro, but without chicken and serranos, and they may use raw onions there instead of grilled onions. 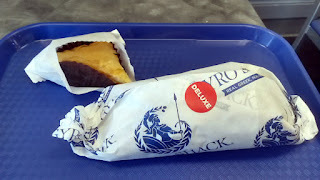 Three days later, I returned for another gyro, one that I will definitely get on a more regular basis. 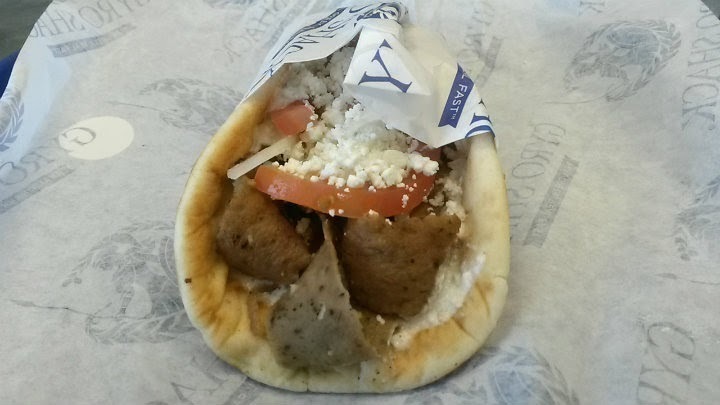 The deluxe gyro ($6.69) contains tzatziki, gyro meat, tomato, raw onion, and feta cheese. Very delicious, and the simplicity here allowed me to really appreciate all the ingredients. I loved the crunch of the raw onion and the slight saltiness of the feta. 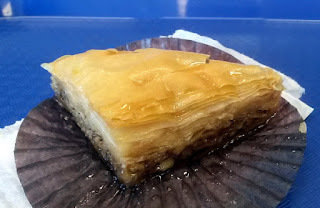 I also enjoyed a piece of baklava ($1.99). Sticky, but delicious and not too sweet. 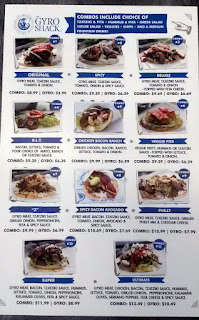 I think that either the Deluxe gyro or the Spicy gyro will end up being my go-to options. The spicy gyro has gyro meat, tzatziki, tomato, onion, and spicy sauce. And of course, there's nothing wrong with the original gyro (gyro meat, tzatziki, tomato, and onion). The area has many new eateries now, and there wasn't a lot of business when I went there both times (about 11 AM on a Saturday and about 12:30 on a Tuesday).